Preheat oven to 240°C (475°F). Place the cauliflower, oil, salt, pepper and tarragon on an oven tray lined with non-stick baking paper. Cook for 15–17 minutes or until golden brown and tender. 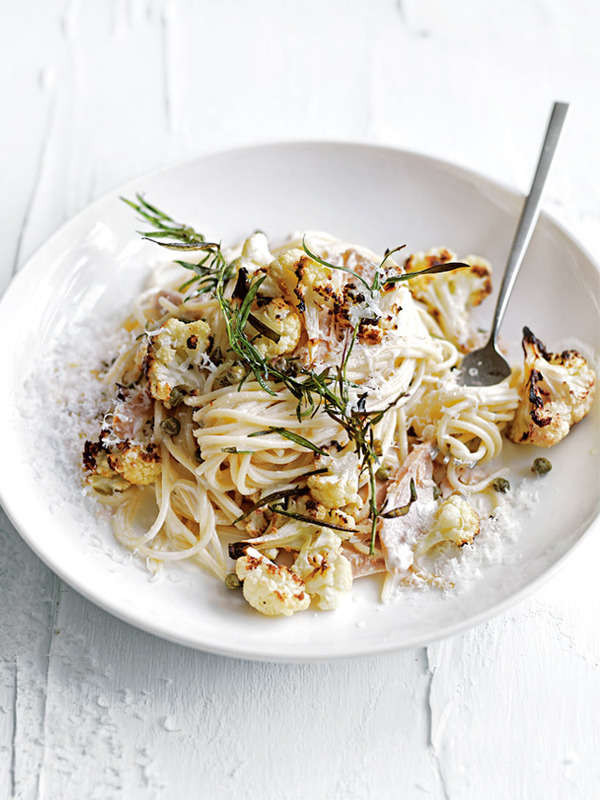 While the cauliflower is roasting, cook the pasta in a large saucepan of salted boiling water for 6–8 minutes or until al dente. Drain, reserving ¾ cup (180ml) of the cooking water. Return the pasta to the saucepan. Add the crème fraîche, tuna, lemon juice and reserved cooking water and stir to combine. Divide between bowls, top with the cauliflower, tarragon and capers, and sprinkle with parmesan to serve. Serves 4. This is our family favourite pasta recipe using our home grown cauliflowers and lemons.